WASHINGTON (May 19, 2010) -- Soldiers already have uniforms that blend them into their surroundings. Now there's instructions on how to have a weapon that blends in too. In April, the Army released instructions on how Soldiers can apply spray paint to their M4 or M16 rifle, without decreasing the effectiveness of either the weapon or the installed optics. 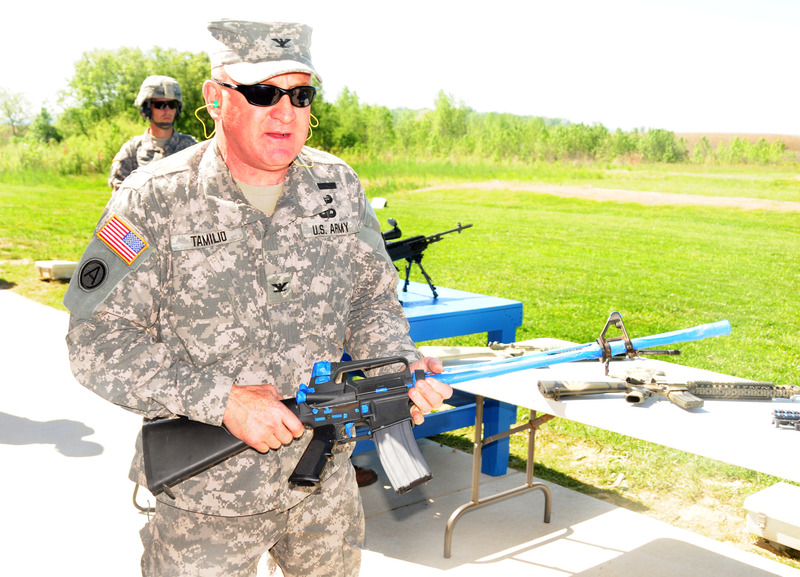 Col. Douglas A. Tamilio, project manager for Soldier Weapons, Program Executive Office Soldier, holds an M16 rifle that has been taped up in preparation for applying spray paint camouflage. "The Army has always had techniques to camouflage the Soldier ... we have techniques for the Soldier and the equipment," said Col. Douglas A. Tamilio, project manager for Soldier Weapons, Program Executive Office Soldier. "We found in Iraq and Afghanistan that Soldiers were starting to paint their weapons. It wasn't really approved or disapproved for them to do that." Tamilio said the Army worked with the Army Tank-Automotive and Armament Command as well as the Army Research, Development and Engineering Center to put together the instructions. The resulting document, "Maintenance Information Message 10-040," is titled "Camouflaging Specific Small Arms." It focuses on where to apply tape to protect sensitive areas, what areas should not be painted, and what kind of paint to use. "It just shows Soldiers how you tape your weapon up before you go to spray it," Tamilio said. "We are just trying to make sure the Soldiers don't do the wrong things with their weapons. So we make sure we don't reduce the reliability of our weapons system." The new MIM explains the rationale behind why Soldiers would paint their rifles. "Warfighters must be able to conduct tactical operations while reducing/limiting detection by the threat," the message reads. "Camouflage paints provide for reduced visual detection and enhanced warfighter survivability via neutral, non-reflective, and predominantly non-black colors." Additionally, the message explains, the color black is "highly infrared reflective" and it can also "provide a high degree of visual contrast when carried by camouflaged uniformed warfighters." The instruction goes on to explain the materials a Soldier would need to clean his rifle before painting, the types of paint he can use and where to procure them, where to put masking tape on the rifle to protect sensitive parts, and how remove the camouflage after it is no longer needed. To protect the inside of the barrel from receiving paint, for instance, the message tells Soldiers to "take a foam ear plug and insert it in the front of the barrel using firm pressure. Do not use a cleaning rod or any other tool to do this." On actually applying a camouflage pattern to the weapon, the message suggests Soldiers have a plan in place beforehand, and that their design focus on effectiveness rather than beauty. "Remember, most great camouflage is not pretty," the instruction reads. "The goal is to blend your weapon in with the environment in which you are operating. If you are operating in an environment that just has light tan sand, then just paint your weapon tan with limited black breakup ... This procedure's purpose is not to impress. Its purpose is to provide safety and another tool in defeating the enemy." While the Army has provided an official guide on how Soldiers can paint their rifles to provide camouflage in an environment where camouflage may be needed, Tamilio said the instruction is not permission for a Soldier to paint his weapon. Permission, he said, comes from a unit commander. The instruction is simply a guide on how to proceed if a commander gives that permission. The full MIM 10-040 instruction is available online at https://aeps2.ria.army.mil/commodity/mam/tacom_wn/mim10-040.html. In order to access that document, Soldiers will need an account with Army Knowledge Online. A more abbreviated version of the instruction, with photos, is available at https://peosoldier.army.mil/docs/blog/weaponspainting101.pdf.